The preliminary report is that we do indeed have good news to celebrate! The doctor told Don and I today that the CT Scan shows that the four largest nodules of cancer — two in each lung — have decreased in size. In the right lung, the 12 mm shrunk to 10 mm and the 15 mm to 11 mm. In the left lung, the 12 mm shrunk to 10 mm and another 12 mm shrunk to 9 mm. Other nodules in both lungs were too small to measure any changes on a CT Scan. (I think that means I will have the more sensitive PET Scan again at a future date.) Other very positive news is that nothing “new” showed up. The doctor told me that, of course, any decrease in size is good news and that the report is about what we could have expected at this point in my chemo regimen. In her words, we are headed in the right direction and we’re going to keep on going. I don’t know exactly what I was expecting. I think I wanted the news to be so miraculous that someone could give me an end-date for chemo. Or even an approximate. I want that so darned bad. Indeed, it is really weird to feel the slightest bit ungrateful for whatever gifts we receive. Feels a little like the kid at Christmas who rips open package after package, hurridly moving on to the next one before enjoying the one at hand. I feel so very happy, yet also so very conflicted. Cancer, cancer treatments, the physical, the physiological, the psychological. It’s all so very, very hard. I just feel so very, very tired. Like a boxer who’s in Round Three, with many more rounds to go. Then again, I can see that the opponent is getting beat up and battered. And in the end, I’m hoping and praying that slow but steady wins the race. I’ll go into HOW I finally got an appointment to get my results in a future blog. Just know that after hours of trying, I finally found a way to get through. It emotionally and physically wiped me out, but I will not have to wait until Monday. No patient should have to go through that, least of all a Stage 4 cancer patient waiting for pivotal results. I have an appointment at 3 p.m. today. So much hinges on the results of this first CT Scan since I began chemo on Feb. 1. Please pray for miraculous results. Ring, phone, ring! Photo by Amy Rauch Neilson. I’ve got half of the equation, but don’t know how to figure out the other half. Following my CT Scan Monday, the Radiologist said my results should be read by Wednesday. I just figured out that I don’t know how to get my results, short of waiting for my appointment with the doctor on Monday. I made the mistake of not asking the question, pinning someone down as to how I might get my results. My results could be sitting in an in-box somewhere, or on someone’s desk, days before then. I called my oncologist’s office. Busy place. It’s almost impossible to get a human. If you want to speak to a nurse, you have to leave your name and number and wait. 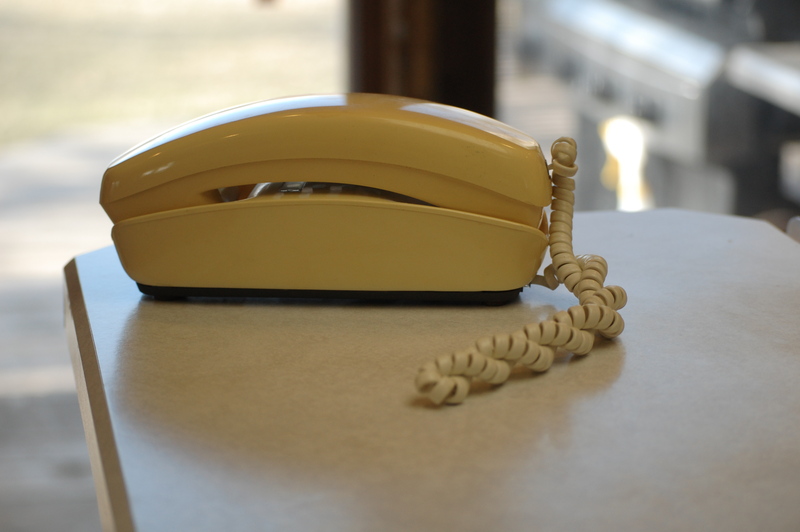 There’s also a section of the recording that announces that test results won’t be given over the phone — that you have to make an appointment to get them. I have an appointment. But not til MONDAY!!!!!!!!! Please don’t tell me that if the results are in later today, tomorrow, Friday, that you’re going to make me wait that long. That would be sheer agony. Beaumont’s protocol in this regard seems vastly different from that of the University of Michigan Hospital. That’s where I had my breast cancer surgeries and testing done following my 2006 diagnosis. Chalk one up for U of M — the nurse would call me immediately whenever a new test result came in. I could depend on that. That gave me a little bit of security during a time in my life when I felt the floor could open up at any moment, that I could fall through a trap door. And yes, they gave test results over the phone. I never had to wait, worry and wonder if perhaps the results were in and someone just hadn’t gotten to them. Or that they were waiting for me to come into the office — still many days away. I knew that as soon as they had them, I’d have them. So, today, right now, that’s my challenge. It doesn’t feel good. In fact, it feels awful. I feel helpless. And it pushed me over the edge. Lots of wracking sobs over here today. Will the scan results make that big of a difference? Yes. My first scan post my first three rounds of chemo should indicate where we are in this battle. Are we in hot pursuit? Making great progress? Or, do we need to restrategize, change tactics? They could indicate whether I’m going to need a longer chemo regimen — or, my hope, shorter. To say that my life hangs in the balance would not be overly dramatic. Knowing, whatever it is, has got to be better than the limbo I’m in. But I’m kicking myself. I shouldn’t have put myself in this position — allowed so much of myself, my emotions, to hinge not only on the results, but on getting them today. Shouldn’t have set the bar so high. But that’s what I did. And here I am. Waiting. Crying. Trying to calm myself down. Feel something other than terror. Or of being so alone. Trying to accept that the results will get here when they get here, and that they’re going to be what they’re going to be, whether that’s today, tomorrow, Friday, or, ugh, even Monday. Trying to do a normal day of life — whatever normal is these days. Sometimes I feel so small, particularly in comparison to the enormity of the world around us. I think of the sheer numbers of people affected by the earthquake and tsunami in Japan – numbers so big I can’t wrap my brain around them no matter how hard I try – and I feel miniscule. I look up into the night sky in all its wonder, with the knowledge that the glow from a star shining down from above has traveled thousands of light years to reach me, even that the star may have burned out eons ago. And again, I feel tiny. To read the rest of this blog, hop on over to The Pink Fund. Photo by Amy Rauch Neilson. They don’t mean to do it. They’re just doing their jobs and you just happened to catch some of the, er, overflow, the leakage. That’s what happened to me in late January, as the surgeon and staff were about to slide me into the CT Scan tube and begin my lung biopsy. I was lying there on that very narrow table, positioned on my left side, my right leg hanging over awkwardly and lying in a sling. It was uncomfortable sure, but gave the surgeon the best angle from which to enter my right lung and grab a piece of the suspect growth — what had showed up as a “hot spot” on my scans. Lower lobe? There was more than one lobe of my right lung showing suspected spots of cancer?! It wasn’t until that very moment, lying on the table in that very vulnerable, compromising position, that I had any idea there was more than one lobe of my lung involved. I panicked. I started crying. Hard. Everyone in the procedure room froze. Then I heard the swinging door open and shut. A few seconds passed, maybe a minute. Then Don appeared. I could feel myself winding up again, losing control, sobbing harder. Don began to rub my back. “It’s going to be OK, honey. It’s all going to be OK.
“I was just talking to Robin and Claire (the nurses who head up my Clinical Trial) in the waiting room and I asked them to level with me. I said, ‘Don’t sugarcoat this. I want to know. Is my wife going to live? “And you know what they told me, honey? They told me they felt quite confident that you don’t have just mere months left, but years. Many years. “It’s going to be OK,” he repeated, pushing a few damp, clingy, stray strands of blonde hair out of my face. Don was so, well, together. I don’t know how he does that. But I’m glad he knows exactly what to do when I’m nearing the depths of a total meltdown. His voice, his presence, his words calmed me. I nodded. I trusted. I let them give me the sleepy stuff and start the procedure. The biopsy results did indeed confirm what my doctors has suspected — breast cancer had metastisized into my right lung and affected more than one lobe. What happened that day wasn’t anyone’s fault. A diagnosis like mine touches off a domino effect of organized chaos. There’s a rapid-fire pace in which all of the tests are conducted, in different areas of the hospital, with different doctors in charge, all sharing the same information about my case and for one purpose — to figure out how to save my life and the best way to do it. No one means to blurt out information at such a vulnerable moment — or any moment, for that matter. But it happens. And it’s hard. It’s hard on the patient, who takes that experience into future scenarios and feels the anticipation of terror. That’s what happened to me yesterday, when all I was doing was going in for a simple CT Scan of my chest, with contrast. But as the radiologist began pushing the narrow table I was lying on into the tube, my heart began to race. What if they see something and inadvertently slip-up, tell me something they think I already know, but don’t? What if it’s something awful? Nothing like that happened. I simply lay in the tube, drawing in a big breath and holding it upon command, then letting it out. There was a warm, burning sensation that spread from the IV site in my arm through my chest and into my groin. My saliva had a metallic tinge. The radiologist placed special pads over me to protect my thyroid and chest from the radiation. I couldn’t stop the tears from flowing as I lay in the tube, listening to the clicking of the machine, waiting for the commands from the radiologist. They were hot and ran down my cheek and into my right ear canal. I wanted to shake my head like a wet dog. But instead, I lay still. And then it was over. I was all done, free to go. If there was any information to be leaked, it hadn’t been. All they told me was that I should have the results by Wednesday. Tie Your Laces and Let’s Go! Don, ever my cheerleader and best friend, holding the sign he made for Amys Walking Angels in 2008. Photo by Amy Rauch Neilson. I was diagnosed with breast cancer for the first time on March 3, 2006. And somewhere amid the flurry of tests and results, surgeries and treatments, my friend Mollie Finch pulled off something pretty extraordinary. She organized the very first team of walkers to represent me in the Susan G. Komen Race for the Cure: Amy’s Walking Angels. The walk is a 5k, but there’s also a one-mile option for people who can’t go the distance. I thought I’d be one of those people that June day, as I’d started chemo just a week earlier. My goal was to simply make it to the end of that first mile, Don and all of my teammates by my side, Theo, who was only nine months old, in the stroller. But somehow, as I approached the one mile marker, I didn’t feel tired. I felt energized. I kept going. And I made it the whole way. I was elated. There is something so invigorating about being surrounded by people who love you, who are walking in support of you, united in the effort to halt this disease in its tracks. 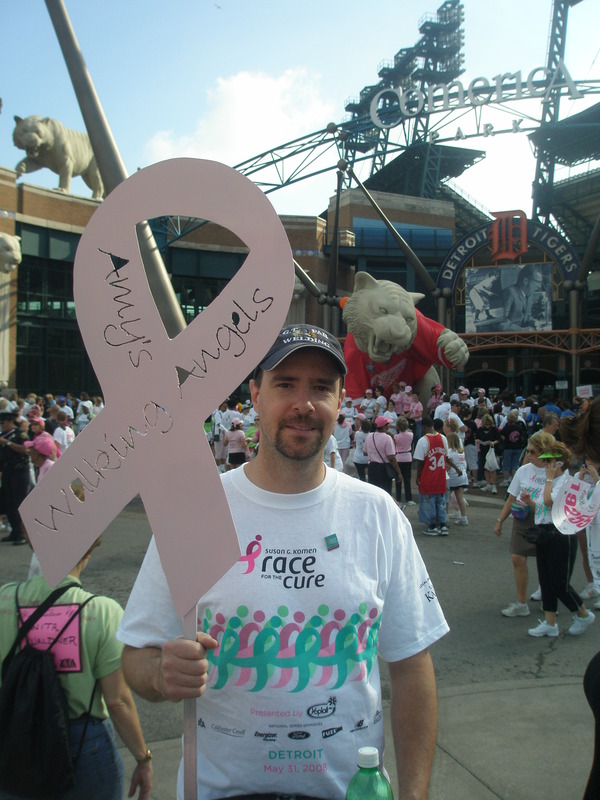 Mollie’s doing it again — organizing the team for the Amy’s Walking Angels component of the 2011 Susan G. Komen Race for the Cure on Saturday, May 21. The walk starts and ends at Comerica Park in downtown Detroit — we meet there round about 8 a.m. and we’re home by Noon. Sometimes, we stop in Mexican Town for lunch afterwards. I’d love to see you out there. I’m even thinking of printing matching ItsInTheGenes.org T-shirts this year. It’d be a first for our team. If you’re interested in a T-shirt, let me know at amy@itsinthegenes.org and I’ll see what I can organize on my end. Who knows what we might be celebrating that day? My first post-chemo scan is today at 2:30. Within a few days, I should have the results that tell me how effective the first three rounds of chemo have been. Please pray for something miraculous and completely unexpected — something beyond explanation. I hope my lungs and lymph nodes are completely clear and that my chemo regimen will be shorter than originally anticipated. On the way home from chemo last Friday, this very subject came up between my friend Diane and I. I said, “Maybe my regimen will be shorter than we think!” And at the very same moment we looked at each other and blurted out, ‘June 1’ as an end-date! It was eerie and funny all at the same time. As soon as I know my scan results, I’ll let you know. In the meantime, get your racing shoes on! For more information and/or to sign up to be a part of Amy’s Walking Angels, contact Mollie Finch at molliefinch81@yahoo.com. 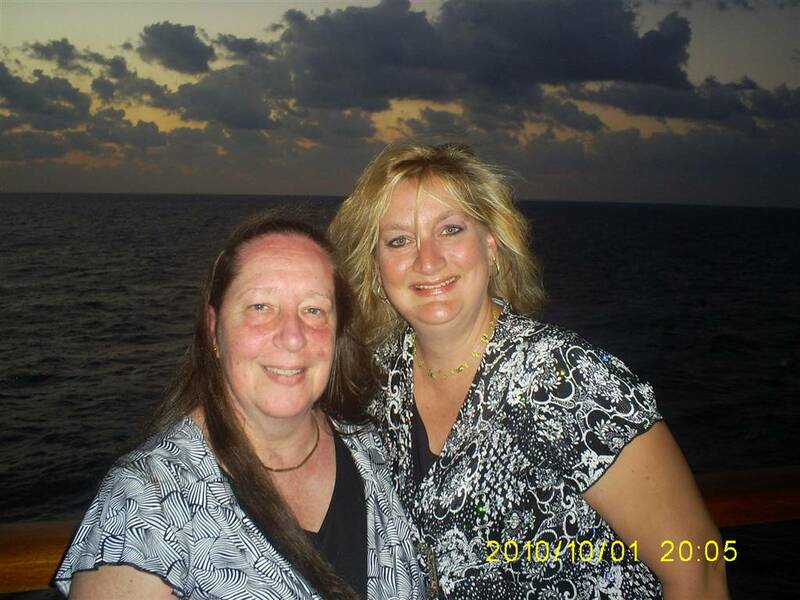 Sailing the Caribbean with my sister-in-law, Debby, October 2010. Photo by some Anonymous Passer-By. When I graduated with my master’s degree in 2008, my friend Betsy mailed me a dog. No, not a real, live breathing canine — though as she and I are both crazy about those furry creatures and own multiples of them, that wouldn’t have been such a stretch. She sent me a white puppy, resting on its haunches. The ears, tail, top of the head tell me that she’s supposed to be a poodle. I say “she,” because she’s wearing a pink collar, pink ribbons in her ears, and a pink mortarboard with a gold tassle. The rest of the dog is a smooth, white faux leather. She came with a special, permanent marker so that people could sign their well wishes all over her body — and I could keep her as a memory of that fine day in my life. Which I do. She made her home in my office, on the top shelf of my desk. When I look up at her, I see the first and biggest signature on her body. It’s written across her chest: Carpe Diem. My brother-in-law Dave is the one who scrawled that Latin phrase: Seize the Day! Every now and again, as I’m looking off into space, trying to come up the perfect word, sentence or phrase for whatever I’m working on, I catch her — and that phrase — out of the corner of my eye. And I think to myself, Is it ringing true in my life? The answer, most of the time, is a clear, emphatic, YES! Am I Seizing the Day? And what does it mean, to Seize the Day? Surely each and every one of us has a list of the stuff of life that we must do in order to keep on chugging along, whether that means dropping the kids off at school, hitting the grocery store, folding the laundry, paying bills. Seizing the Day can be about a moment or a day, or even longer. At different times, on different occasions, it is defined as all of the above. I most recently conducted my “litmus test” on the phrase and its place in my life after my Stage 4 breast cancer diagnosis. I did a quick, recent review of things I’d done to truly Seize the Day in recent months. And I came away quite satisfied. In just the three months prior, I’d modeled in the Bras for a Cause Event at the Royal Oak Music Theatre, spent an evening at my cousin Tammy’s house, carving pumpkins with my family and drinking apple cider around the bonfire. We’d spent Thanksgiving in Georgia with my family — something I’d always wanted to do. And Don, Theo and I had one of the most memorable, beautiful Christmas celebrations ever. Time spent with extended family; time spent just the three of us. One other very significant stretch of days came to mind. The five days I’d spent on a caribbean cruise with my sister-in-law Debby in early October. It was a trip we’d begun planning a full six months in advance. Daily, we’d text each other a countdown of just how many days left until our ship sailed. That trip was one I wasn’t sure we could swing. It was right on the line. I wanted to take Debby to see something she’d never seen before — the ocean. I wanted to spend one-on-one time with her, far far away from everything. I wanted to take her snorkeling, read books by the pool, order champagne at dinner. I talked to Don about it. Could we afford it? Together, he and I worked on the budget so that we could make it so. It was one of the most wonderful trips ever. And I’m so glad we did it, on so many levels. Do I think that it was my last chance to do something like that, because I am not long for Planet Earth? Certainly not. But I do know all too well the unpredictable twists and turns life takes, and that, not knowing what they may be or when, it is imperative that, whenever we have the opportunity, we Seize the Day. Before you say, “No, it can’t be done,” take a minute to think outside the box, see if there’s a way to make it work. You might surprise yourself. Note: This weekend post is for you, Deb Peters of New Zealand!